Our packages make it easy to achieve the looks currently seen on Pinterest! Simply rent one of our sets and get everything you need to complete the look, without all the stress. 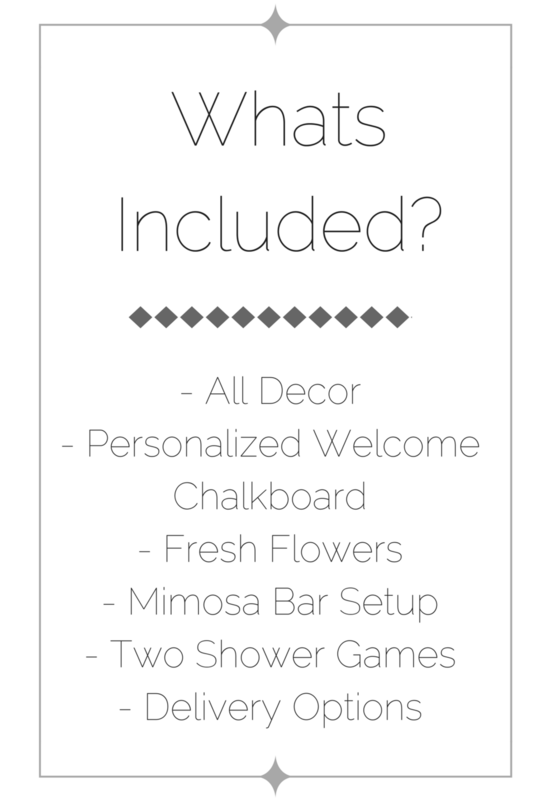 Your event decor is all together in one, simple-to-setup, rental package. Showers by Ally was an idea born of witnessing the stress and frustration friends and family experienced when planning showers. I always loved the chance to step in and take over, as there is nothing I love more than a good Pinterest party! However, I realized not everyone shared my love for store hopping, crafting banners, and searching for all those small details it takes to throw a "Pinterest-worthy" shower! (what?!?!) Already having a career that takes a majority of my time, there is rarely an opportunity to setup showers for others! Plus... I found that people were a bit more budget conscious with the shower knowing a wedding was coming, and to hire a party planner = $$$! So I decided to come up with a way to design budget friendly showers for people without having to be there in person!